This time last year I called THE ARTIST for Best Oscar solely based on the grounds that Harvey Weinstein had personally introduced it at the London Film Festival, indicating that the Karl Rove of Academy campaigns was putting his not inconsiderable weight behind it. It didn't, of course, hurt that the movie did the two things that Hollywood absolutely loves: a) cast a nostalgic eye back to its own history and b) make us laugh, make us cry but with a outer casing of Profundity to make us feel less superficial while we get our kicks. This year, on the same logic, I'm calling ARGO for Best Film. Harvey isn't involved this time, but they flew out EVERYBODY for the red carpet PR fest last night, not to mention the fact that The Hollywood Reporter is already running front cover articles on Ben Affleck's comeback. And, per my second rule, this movie is an exceptionally well-made crowd-pleasing thriller. But because it's based on real events in Iran, it makes us feel like we learned something too. In short, ARGO is not a film we're going to remember in ten year's time - it's not a movie that remakes the boundaries of the cinema. But that's okay, we here at MOVIE REVIEWS FOR GREEDY CAPITALIST BASTARDS are all about genre movies that aren't ashamed of what they are, do the job well, and make piles of phat cash in the process. The basic history is that in 1979, the US embassy in Iran was stormed by pissed-off Iranian revolutionaries and the staff taken hostage. The Khomeini revolutionaries wanted the despotic Shah of Iran returned from his asylum in the USA to face charges, which evidently wasn't going to happen. Meanwhile, 6 embassy staff had managed to sneak out and were hiding out in the Canadian embassy. 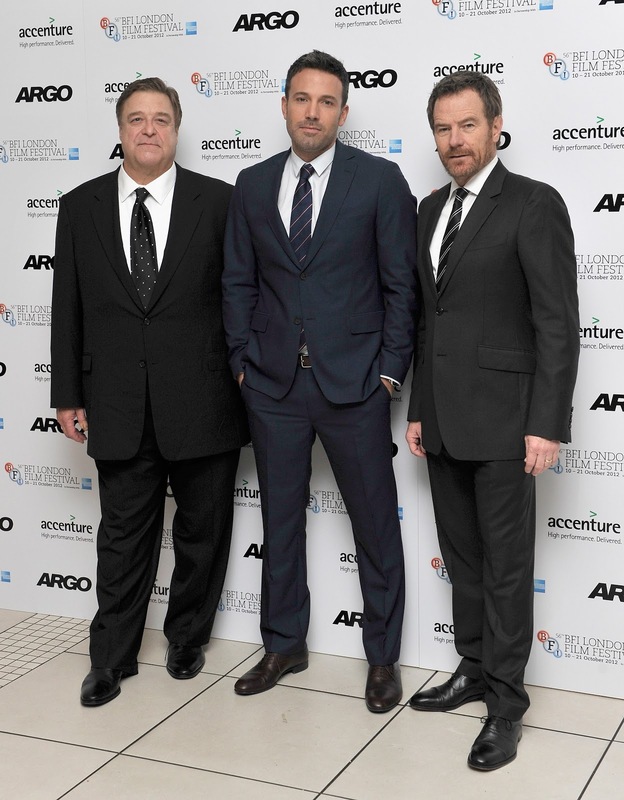 The CIA's specialist "exfiltrator" Tony Mendez (Ben Affleck) created a cockamamie plan to get them out: create a real life Hollywood production company with a real life script and pretend the embassy staff were the film crew were scouting locations in Iran. He flies in alone, gives them their cover stories, and flies out with them through an airport crawling with revolutionary guards. 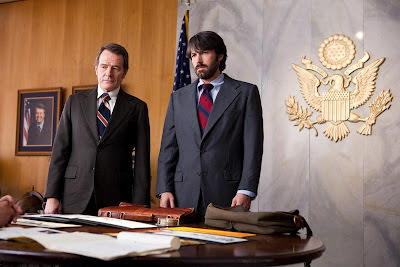 The genius of a movie like ARGO is that, if done well, even though we know the ending, every time our band of civil servants goes up against a checkpoint, we are completely nervous about whether they're going to make it. This kind of tension relies upon perfect pacing and editing, and performances good enough that we like and care for the characters. Moreover, with a movie like this, where the stakes are so high but the cover story so ludicrous, it takes a special kind of director who can keep the balance between laughs and tension. In this film, the ensemble cast is superb - with small parts for the likes of John Goodman, Alan Arkin and Bryan Cranston to name but a few. It's a movie in which no-one carries the film, although I'd like to give special props to Scoot McNairy (KILLING THEM SOFTLY) who surprises his fictional colleagues and us with a last minute character turnaround that has us whooping with joy on the inside. But really, the success of this movie is down to Ben Affleck's direction - his choices, his ability to handle the tonal shifts and intercut scenes of madcap Hollywood with absolutely grave images of hostages, his ability to make us care and have us on the edge of our seats. The proof of that - if proof I needed - was when the plane took of Tehran airport and left Iranian airspace and the audience watching the movie burst into spontaneous applause. That really is proof of how good this movie is. Like I said, ARGO is "just" a factually based thriller. But it's about as good of a thriller as you are likely to see. It shows the hidden courage and patriotic service of a handful of Hollywood insiders and CIA men, and the public courage of a handful of Canadians. It makes us feel good about ourselves, and doesn't hide the contemporary relevance and grey shading as to why the Iranian revolutionaries were so angry at the Americans. Kudos to all involved. John Goodman, Ben Affleck and Bryan Cranston. ARGO played Telluride, Toronto and London 2012 and is currently on release in the Ukraine, Canada, Colombia, the USA, Argentina, Serbia, Australia, New Zealnd, Russia, Singapore, Japan and Spain. It opens on November 2nd in Finland, on November 7th in Belgium, France, Switzerland, Denmark, Germany, Greece, Italy, the Netherlands, Portugal, Brazil, Ireland, Norway and the UK. It opens on November 15th in Hong Kong and Slovenia and on November 23rd in Sweden.